Composted poultry and hatchery waste (egg shells), manure and other plant materials. 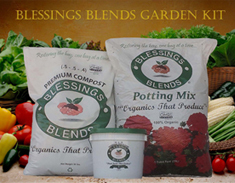 BLESSINGS BLENDS Premium Compost is a product for improving the quality of existing soils, not a soil replacement. This product should be used as part of a complete fertility program. Potting Mix Blend – Mix 1 part compost to 10 parts soil (or peat moss) for most annuals, perennials, vegetables, ornamental shrubs and trees. Acid loving plants may need an additive to reduce soil pH – consult with your local extension agent or garden center. 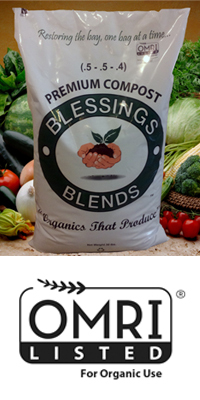 Potted Plants – Sprinkle 2 tablespoons of BLESSINGS BLENDS Premium Compost to the surface of a 6″ pot; 1/4 cup to 10″ pot; 1/3 cup to a 12″ pot. Repeat every 6 weeks throughout the season. Bedding soil – apply 30 lbs. of compost (one bag) per 600 sq. ft. of area to be planted. Rake lightly to incorporate into the top of the soil. Top dress vegetated area with 10 lbs. per 600 sq. ft. every 6 weeks during growing season. Contains humus – assisting in soil aggregation and making nutrients more available for plant uptake; Buffers soil pH.